Luker was interested in Argentina because it was poised at a critical moment in its history: when its economy collapsed, so did the pillars of Argentine identity, like job security and a strong middle class. The country faced the prospect of remaking itself. Argentinians were asking, “Who are we?” and “What are we doing?” For an ethnomusicologist like Luker—someone who seeks to understand the way that music and culture intersect—this was an enticing case study. He decided to head to Buenos Aires to observe the music that was arising out of this unique historical moment, particularly Argentina’s rock and avant garde. But not tango. That would be too stereotypical. Too expected. Too, well, cheesy. Luker grew up as a jazz saxophone player in a postindustrial town in northern Minnesota and went to college to study music performance in Wisconsin. Hungry to engage with the world beyond the Midwest, he played in a wide variety of bands: jazz, funk, rock, Ghanaian highlife, and klezmer. He even performed in a tango ensemble, playing saxophone in an Astor Piazzolla cover band—a difficult feat considering the complexity of the legendary bandoneonista’s tango nuevo compositions, which incorporate jazz and tango elements and had to be hand transcribed by Luker’s band. Luker was a dedicated musician, but then something changed. 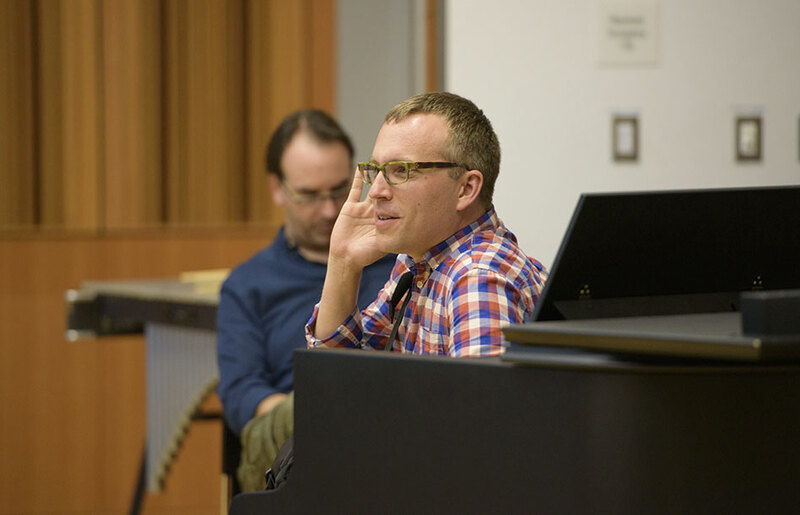 An influential professor introduced him to cultural studies and its theoretical underpinnings, and Luker began to think about music as a space where politics, identity, and cultural history are hashed out. Music was more than just a series of notes: it came from and spoke to larger issues in social life and history. His friends noticed he was spending less time in the practice room and more time in the library. His five-hours-a-day practice dropped to four hours then three. He was being lured away by his deepening interest in music scholarship. He changed his major to music history. After graduation, he put away his saxophone and went to Columbia to pursue a PhD in ethnomusicology. The music he was hearing was tango. Like jazz, tango is a vast and diverse musical complex. There are genres and subgenres, from dance music to concert music and everything in between. It is a sophisticated, robust musical tradition that defies the oversimplified, Rudolph Valentino–inspired Hollywood stereotypes with roses and dance shoes. It has a storied past: from its emergence in the urban immigrant culture of Buenos Aires’s coventillos (tenements) to the Parisian tango craze in the 1910s that spread throughout Western Europe. After the golden age of the 1930s through 1955, tango fell out of favor and ceased to be popular participatory culture in the 60s and 70s, when Argentina was under a series of dictatorships and young people associated tango with reactionary politics. In recent decades tango has enjoyed a renaissance. To this day in Argentina, to say something is “Gardel” (after legendary tango singer Carlos Gardel) means something is the absolute best of its kind. And yet, despite the fact that tango is a national brand for Argentina, most Argentinians don’t listen to it. Like any music, tango provides a fascinating lens through which to view cultural and political history. Luker researches and writes about what this music with deep national roots can tell us about Argentina today. In his book, The Tango Machine: Musical Culture in the Age of Expediency, published recently as part of the Chicago Studies in Ethnomusicology series at the University of Chicago Press, he explores the paradoxical way that Argentina embraces tango as a cultural resource, even though it no longer operates as socially popular music among Argentine audiences. Prof. Morgan Luker discusses tango history at the 2016 Tango for Musicians at Reed College. Luker is Reed’s first ethnomusicologist, and in his courses like The Cultural Study of Music, there’s no requirement to learn your circle of fifths. You need only to listen rigorously. On the first day of his Tango: Music, Culture, History class, he plays an early tango piece over the classroom speakers. Beneath the hiss and crackles of an old recording, a large brass band plays an upbeat early-20th-century composition. Luker asks for reactions—nothing is off limits. He tells students that part of their goal is to learn to develop their critical listening skills and audio vocabulary, and they are responsible for regularly turning in four-page listening journals about a single piece. It seems like a lot, but he promises that with practice they will soon find it easy to fill four pages with observation. They will begin to hear how sound is making an argument, to “read” an audio sample like a text, and to make more nuanced observations about things like performance practice. “Don’t be afraid to state the obvious,” he says. “The surface is important.” Trying it out, students comment about the rhythm, texture, genre, and the quality of the very old recording. Luker suggests they not forget to list the instruments they heard. 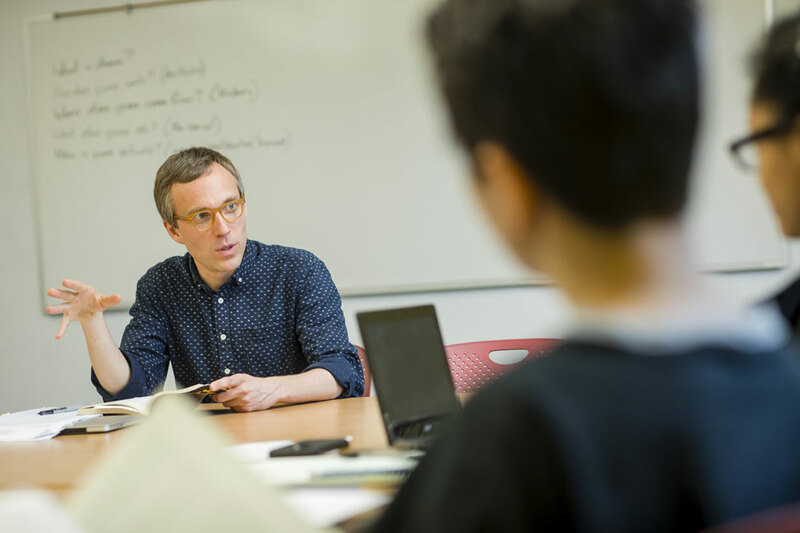 Tyler Allen ’17, a history-lit major who is working with Luker on her thesis, notes that he teaches students to listen, not just to music, but to people, their stories, their reactions. She is struck by how he puts into practice this skill when working with students. “Morgan is interested in what you have to say,” she says. Such support has been transformative for her, a first-generation college student from a working-class background who assumed the music major was only for students whose parents gave them cello lessons. Since taking his Music and Politics course her junior year, however, she has enrolled in as many of his courses as she could, and is applying to PhD programs in ethnomusicology. Ethnomusicologists are using tools and rigor previously reserved for studying classical Western art music to unpack what popular music—like tango, rock, or R&B—can tell us about culture, power, and history. Luker notes that the justification for studying music in academic contexts has too often been because “classical music is great.” “I think that music as a field has come into crisis because of that. In an era of tremendous institutional change regarding the value of the humanities, you can’t just say, ‘Beethoven is the greatest and that’s why we need a professor who does Beethoven.’” In recent decades, such thinking has shifted and music scholars are looking far beyond the masters of the classical cannon. On a chilly November day, late in the semester, Luker’s students shuffle in. They are somber and quiet, which is highly unusual for this group. The class has been talking about the political chaos of 20th-century Argentina and the tango music that developed in this context, but these students are preoccupied by U.S. national headlines in the wake of the election and student activism on campus. They share with one another their concerns and fears. Luker asks what would be useful for class that day, and the students agree that they want to “just listen to the music.” Someone says that for her music is “a way to lose myself and forget what’s happening on the outside.” Someone else jokes, “Music heals all.” They all exchange smiles and the atmosphere relaxes. Luker preps the recording on a computer next to the whiteboard and gives some preliminary information. The recording, “La Llamó Silbando” by Horacio Salgán, is from 1952—just before the abrupt end of tango’s golden age and the beginning of one of Argentina’s several late-20th-century military dictatorships. Ethnographers often ask how their work can be more reflexive with the people and communities they study. Many promise to share the products of their research, but Luker seeks to do more for the community of musicians and the music he studies. 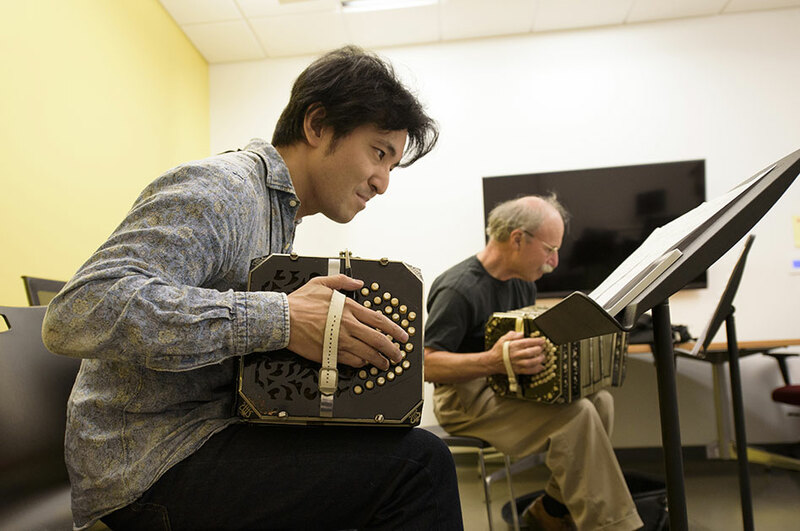 As part of his effort to give back, Luker started an ambitious program called Tango for Musicians at Reed College—a workshop for musicians interested in delving into tango musicianship. The workshop is in its fifth year and has come to be known as the preeminent place to study tango in North America—for professional musicians and hobby players alike. Participants, often entire ensembles, come from around the world—Europe, Asia, Australia—to study with artistic faculty who are among the most prominent tango composers, players, and teachers in the world. 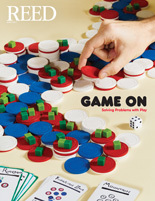 This year the institute runs June 25–July 2. The faculty include the program’s artistic director, flutist, and composer Paulina Fain; composer Diego Schissi (who recently performed at Reed in a mini residency with his quintet); violinist Ramiro Gallo, and many other well-known tango artists from Argentina. Although many student participants are professional musicians, there is an auditors track, and Reed students who are interested can attend for free. This year, for the first time, there is an entire program for composers. Luker invites the wider community to attend any of the many public events, including the milonga (a tango social dance event). It’s a significant undertaking, and Luker notes he feels enormously fortunate to have the support of Reed in producing this unique opportunity for cultural and musical exchange. “Reed is a space that allows this kind of thing to happen,” he says. Learn more about Tango For Musicians at Reed College.